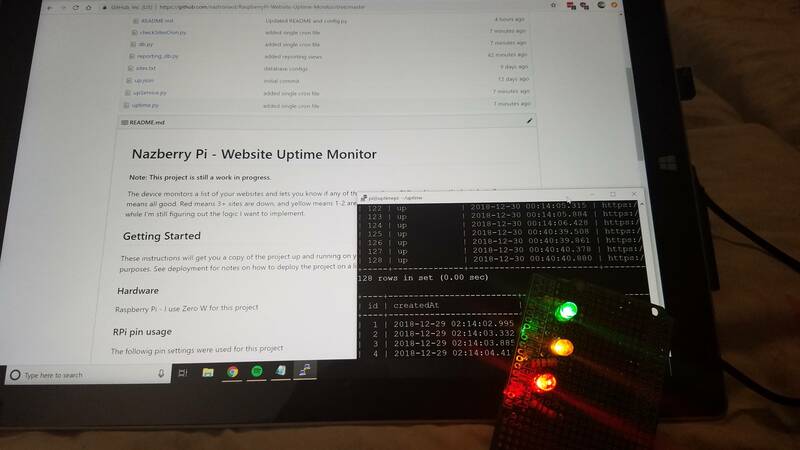 The device monitors a list of your websites and lets you know if any of them are down. Still working on the logic but all green means all good. Red means 3+ sites are down, and yellow means 1-2 are down. More than one light can be on at once for now while I’m still figuring out the logic I want to implement. NOTE: This guide assumes that you have MySQL installed with a database named uptime - you can change the database name and user in the configurations below. Update the directory name as needed. After you clone the repo, you’ll see a file called sites.example.txt in the folder. This is an example list of sites that I’m monitoring. Rename this to sites.txt and add one site per line. If you go to the above URL, you will find that JSON file with that properly. You don’t have to call it up.json but for the time being, the location of the file and the property within it must be the same. This is how the script validates that the website is actually loading content and not just returning a status 200. Avoid having a blank line in your sites.txt file. I may put all of this in database tables at some point in the future. The below configurations are located in config/config.sample.py - before continuing, rename the file to config.py and adjust the values below. There are two main configuration categorie: Database and Email. If you want to use the email functionality, edit the EMAIL_CONFIG object in config.py and enter your username and password. The Mail server and Port are also configurable. By default, this app uses Gmail as the mail server and port 465 for SSL. Feel free to change the values to your own specs. Recommended to keep port as the SSL port. And finally, edit the sender with your email address and recipient as whoever wants to receive the notification. This app currently only allows one recipient. Once you’ve made the edits, move onto the database config. By default, the database name is uptime - if you want to use another name, change it. Update the dbuser and dbpass properties with the credentials that the database will use. The above table is used for turning off the Green LED during off hours using cron jobs explained below. This app runs automatically via cron jobs. You can initialize some Cron Jobs that are put in place. Before proceeding, edit the initCron.py file and edit the two instances of the directory called uptime on line 17 to whatever you called your repository. This script will add the cron jobs listed below to crontab as well as to the cronSettings MySQL table. Running initCron.py will clear your crontab and rewrite all defaults. Enable/Disable Green LED - by default, the Green LED will be turned off between 12:30 AM and 5:30 PM on weekdays and 1 am and 8 am on weekends. This is the assumption that you will not be home to see the light. This will NOT affect the red and yellow lights. You can change the values in the init file or later in the crontab. Email Notification - a cron will run 1 minute after the sites are checked to get a count of how many times a particular site has been down. If a site has been reported down 3 times in a row, it will trigger an email from the sender to recipient email address as specified in config.py. You can also update the database manually. You can also edit the initCron.py file and add a new method or edit an old one with your Cron settings and re-run the initCron.py script. I will add a way to programmatically update your settings in the future. Web service end points have been created with Flask that can be connected to via a frontend web application or a simple Post request. The end points are still being built. The information below will help you get the flask app started as well as understand some of the basic endpoints. Most end points return JSON, some may return basic text. More details below. Note: The flask app is still under construction. So far, a few web service end points have been created. More will be added. Running a flask app is fairly simple. To run apache in front of flask so that you can access your app without needing the port, read the Apache section below. You can now access it from any computer on your network (assuming there are no firewall settings blocking this) by going to http://ip_addr:5000 - substitute ip_addr for the IP address for your pi. Hostname will also work in some instances depending on your network setup. The apache section below will cover how to run your flask app through apache. Details on the Flask app will be posted later. Note: All GET requests below have two URL parameters that they accept. They are page with a default value of 1 and limit with a default value of 25. You can run the website checks manually with /updateStatus - it may take a few seconds to a minute to return something depends on how many sites are being checked. Sites previously checked but removed from the list will return as down. Every time the uptime.py script is run, it’s recorded in the database. The /getActivity end point will grab you every entry. Note that this list can get very long. /updateCron - Changes the crontab values of placed cronjobs based on comment name. PUT request that takes 4 paramters: comment (unique identifier), cronName, cronVal, and enabled (0 or 1). More will be added. Want me to add something specific, let me know! This will install the required depencencies. This will enter your venv/bin dir and download the file from the source (source file does not change often). You can then restart apache with sudo service apache2 restart now. Adjust the directory from /uptime/ as you need to if you created your own directory. Note that you will need to update line 3 and 8 of uptime.wsgi with the correct directory as well. Once this is done, restart apache if you haven’t already, open a new browser and go to http://ip_addr/uptime - if all goes well, the app should load and you no longer need to start Flask every time or use the port 5000. You can use any of the routes available to you. What are the benefits of running apache in front of your flask app? When we create our front-end site, we won’t have to worry about CORS when requesting data. We can simply add our front-end to another folder in our web server and use this as one big app! Want to add an item to the backlog? Submit an issue. RaspberryPi-Website-Uptime-Monitor is maintained by naztronaut. This page was generated by GitHub Pages.